SUMMARY: Moderately quiet, lots of “overhead” – able to power two motherboards at once. Auto temperature control: 1400rpm at 25C, 2500rpm at 70C. The good guys at Vantec were nice enough to send a sample the their latest power supply offering, the Vantec Stealth 420 Watt Power Supply (detail spec here). Note that this power supply is one inch longer than others due to the extra fan, so you might want to check space requirements. The fan control switch at the rear which allows you to set the fans to run AUTO (temp controlled), constant LOW or MEDIUM speeds. I measured fan speeds under all three settings and found very little variation – AUTO @ 1424, LOW @ 1501 and MEDIUM @ 1497. I spoke with Vantec on this and they designed it for low noise, so these speeds are OK; note that as temps increase, under AUTO fan speeds will increase up to 2500 rpm. 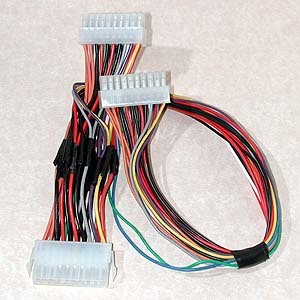 Also included is a 24 to 20 pin convertible connector for 20 pin motherboards. There should be enough plugs for current and new motherboards. What this allows me to do is run two motherboards off the same power supply. XP @ 1500 MHz on a Shuttle AK31. In addition, I was testing a watercooled 80 watt TEC on the KK266+, so I left that on as well. Each motherboard had a hard drive, CD ROM, floppy, video card, 256 MB RAM, KB and mouse – admittedly minimal setups for each system, but hey – there are two of them. To boot two computers, you must turn both on at the same time. I monitored voltages using MBM 5 on both PCs; in addition, I took direct readings from the power supply’s auxiliary pins for direct 3.3, 5 and 12 volt readings. I recorded results running each one alone and each together, in all instances while running Prime 95. Most noticeable is the drop in +12 v values with both running – understandable as the TEC is drawing power; however, what I find interesting is that the Direct Readings do not vary all that much, with the exception of one 12 v value. Both systems ran Prime 95 without any problems. The combined power output of the +3.3 and +5 volt rails is rated at 200 watts. With the CPUs drawing about 120 watts, the power supply’s fans did not spin up noticeably faster. I think this is due to the very wide temp range of the temperature controlled fans – 45 C. As a consequence, the power supply felt warm to the touch but not overly so. It would take a LOT to get the power supply to an internal temperature of 70 C.
I tested for noise by running the power supply by itself in a quiet room. The Vantec Stealth is somewhat noisier than some other low-noise power supplies – understandable as 3 fans are running. I measured noise with a Radio Shack sound meter and could not get a reading three feet away from it. I finally got a 50 dbA reading 7″ from the rear exhaust fan. I don’t think, used with one or two case fans and a moderate CPU fan, that the Vantec Stealth will add much to ambient noise levels. It is moderately quieter than non-temp controlled power supplies. Vantec’s 420 watt Stealth Power Supply should provide enough reserve power for any power hungry system and meets new standards. I especially like the auxiliary switched 110 volt plug – comes in handy for powering water pumps.